Our great state of Texas has been hit hard by Mother Nature. Hurricane Harvey barrelled onto shore, leaving devastation in his path. Streets were impassable and the damage was great. Even if a home was undamaged, thousands were without electricity for several days. Some are still without electricity and have no idea for how long. These natural disasters get me to thinking about emergency preparedness. Note: Some links in this post are for further information from earlier posts I’ve written. But links preceded with * are affiliate links. If you click them and buy something (almost anything, not just the item noted) I could receive a small commission. But the price you pay will NOT change. It’s an easy way to support this blog without anything coming out of your pocket. So click often! Thank you! A few years ago I purchased a solar oven. 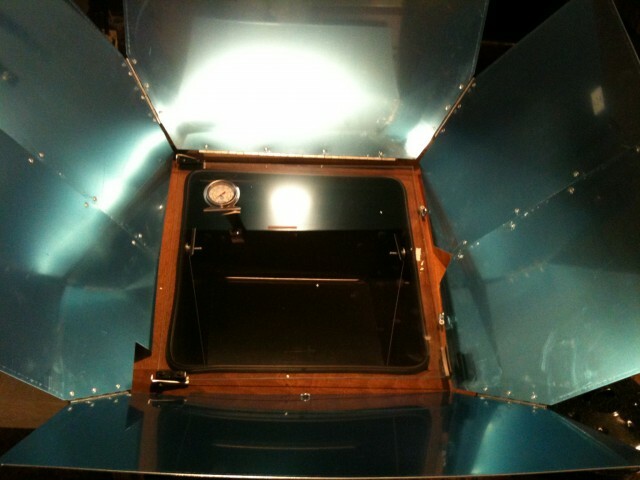 (I purchased my own *Sun Oven and I love it.) Living out here in the country it’s not uncommon for our electricity to go out. As a matter of fact, there were times when our electricity was off for several days due to damaged transmission lines during a storm. But as long as I can see a shadow, I have FREE cooking fuel available to provide food for my family. Cooking fuel of the sun! Oh yeah baby, I’ve used my solar oven to Bake Bread several times, and I’ve also baked Pork Chops, Baked Potatoes and even made homemade Marinara Sauce and many more things. Casseroles are wonderful things to make in the solar oven too, and I’ve made a delightful SW Chicken & Herbed Brown Rice with ease, and RancherMan’s favorite Cheesy Chile Chicken Casserole. 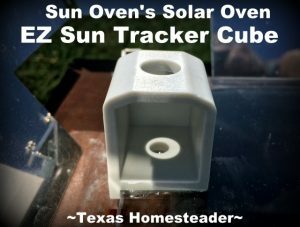 The Sun Oven folks have improved their design since I bought mine – adding a wind-resistant leg with ground stakes, dual-purpose leveling rack, and an extra thick glass door containing sun-tracking cube. Now I wanted that sun cube. BAD. So if the recent natural disasters have you thinking about your own preparedness plans, check out the Sun Oven folks. And tell ’em Texas Homesteader sent ya! This entry was posted in Blog Posts and tagged Cooking, Product Review, Solar Cooking, weather on September 1, 2017 by Texas Homesteader.